Congratulations to Holly George-Warren on receiving the Belmont Book Award from the International Country Music Conference! Nashville, TN – April 29, 2008 – The 25th annual International Country Music Conference (ICMC) is a premier event for country music scholars and enthusiasts. ICMC is pleased to recognize the work of authors and journalists and their contributions in the study of country music by presenting the following awards during the event. The Belmont Book Award is presented annually to the committee's choice as the overall best book on country music. This year's recipient is Public Cowboy No. 1: The Life and Times of Gene Autry written by Holly George-Warren and published by Oxford University Press. "It's a great honor to receive this award for my biography of a man who did so much to advance the popularity of country music around the world," remarked Holly George-Warren. "Gene Autry inspired numerous legendary artists--from Johnny Cash to Solomon Burke to Bob Dylan. I'm thrilled that by recognizing my book, the Belmont Book Award is also acknowledging Gene Autry's many contributions to country music." 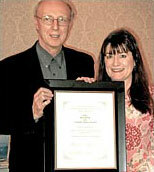 On May 23rd, at Belmont University in Tennessee, Don Cusic presented Holly George-Warren with the Belmont Book Award for Best Book on Country Music 2007. The Lifetime Achievement Award recognizes a long-term commitment to linking books with country music. This year, the award will be presented to the Country Music Hall of Fame Foundation and Library. "This is the first time we've ever given the Lifetime Achievement Award to an institution," said Don Cusic, chair of the awards committee. "In the past, we have always recognized an individual with this award. However, it was clear to us that the Country Music Hall of Fame Foundation and Library deserves this honor." The Charlie Lamb Awards are given to outstanding country music journalists. The 2008 honors will be awarded to Beverly Keel of The Tennessean in the contemporary category and entertainment industry veteran Barry McCloud in the lifetime category. The winner of the Belmont Book Award receives a check for $1,000, funded by the Mike Curb Family Foundation. Each of the recipients in the journalist category receives a check for $500, funded by Gary and Peggy Walker, owners of The Great Escape, in honor of legendary country music journalist Charlie Lamb. All of the awards will be presented at the International Country Music Conference, which will be held at Belmont University May 22-24. Registration for the event is $100. Registration materials must be received by Friday, May 16, 2008. Checks should be sent to James Akenson, Box 5042, Tennessee Tech University, Cookeville, Tennessee 38505. For more information on the conference, visit www.internationalcountrymusic.org.